We've had these for ages! They arrived in a food parcel from Cinabar and were a bit leaky so had oil all over them. I wasn't sure about smoked AND sun dried tomatoes thinking that this might just be too overpowering so popped them in the pantry. Time passed and continued sun-dried tomato eating persuaded me that these could actually be a good idea (or at least worth a punt) so we popped them with pasta and had a go. Turns out that they aren't as strong as I'd expected. The smokiness is very pervasive and certainly clings to the food and in the oil but not in an unpleasant way. 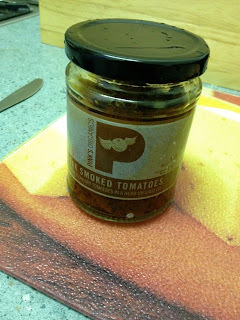 If you like smokey bacon or a good barbecue then this is a nice little hint of that. More freaky to me was the small size of the tomatoes, I'm not used to cherry tomatoes in this manner. The bigger tomatoes seem to have more texture and take a bit of cutting up and these small ones are much more bite size and fragile. This difference isn't a negative one as I think these would work very well in recipes and I intend to try these out in veggie Bolognese with Quorn to add an extra dimension to the flavour. No sun-dried tomatoes look appetising, and leaky smokey ones are doubly repulsive, but in the flavour department these win out impressively.